100 whales, 10 orcas, and more than 90 belugas are all trapped in small pens floating in the Srednyaya Bay near the Russian city of Vladivostok. 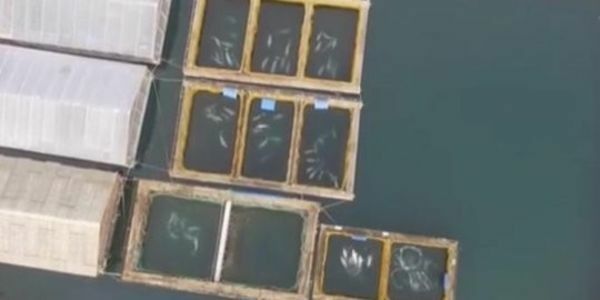 The imprisoned cetaceans have been in the news since October of 2018 when animal rights activists sounded the alarm. The whales, many of them babies, were caught in the open seas by Russian whalers who have been holding them as prisoners until they were ready to ship to marine parks in China. Each one could fetch hundreds of thousands of dollars (belugas) or even millions in the case of orcas. If they made it to China, their lives would be forever changed. They would be relegated to a lifetime of captivity where they would be treated as commodities and forced to perform daily for paying guests. Luckily, it looks like these babies might have a new chance at freedom. The Russian government has seized possession of the whales from the several companies responsible for their capture. They then set up a working group to evaluate how best to go about their release. Unfortunately, because they are babies or very young, it is quite likely that their incarceration has deprived them of learning valuable skills their pod members could have taught them had they been in the wild. It is illegal in Russia to capture baby whales and that law may have been part of the reason the government stepped in. But while this is good news for the baby whales, adults are still able to be captured and traded under Russian law. In fact, between 2013 and 2017, the country shipped 15 orcas to China alone. That means 15 previously free killer whales have forever lost their freedom, living unhappy lives. We may never know their fate, but what we do know is that the capture and sale of these incredible animals is cruel and it must stop altogether. It's time Russia make end their part in the live whale trade. Sign the petition and ask the Russian Ministry of Natural Resources and the Environment and to ban whale capture.